I am not sure how I stumbled onto the deli at Pete's Frootique but its a pretty fun experience. 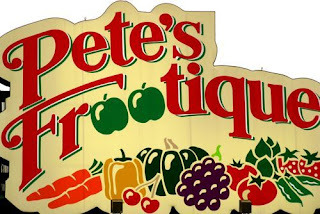 Everyone in the Maritimes knows who Pete Luckett is, from Pete's Frootique and his two stores are an amazing collection of fruit, veggies, breads, sweets, meats and cheese. His business sense is amazing, and his stores are very enjoyable. A few years ago, I decided to take a trip into his newly opened grocery store which is located down town, just off Spring Garden. I wondered around for bit, with a friend, and we noticed the deli type section was really a restaurant type place. Actually it looked like a cafeteria.. with trays, and slide bars where you stood and ordered your food. There is a griller bar there, where you can have what every kind of sandwich you want... grilled, panini'd or plain. Several amazing soups on tap, and omelet bar, and a salad bar. The salad bar perked my interest. I sold a picture as I was heading up stairs to eat my salad, the last time I was there... but its not that clear. When you order your salad you start with a server, like at Subway, but dressed in black. All the servers there have a very professional way about them and I feel they add to the whole experience. The server will ask what size salad you like.. small or large (maybe there's a medium, I don't remember). The server selects an appropriate size stainless steel bowl and their tongs. They wait for you to sing out your choices of what you would like in your salad. Now, they offer 4 types of greens... and then to that they will add a pinch of what every you request. Your choices are endless.. and I kid you not. There is every kind of chopped fresh veggie (they are in the bowls lined up in front of you, behind the glass, sitting in a large bed of ice.) I think you have a choice of 20 or so veggies, then there are proteins like cheeses.. there are 4 to 6 kinds of cheese to chose from, beans, egg, nuts of many types, seeds, grains... raisins, cranberries, olives... I can't begin to list them all. But that's not the end. Then you can chose from 20 different types of salad dresses... all made on location. They add the dressing to the steel bowl and give it a good toss. Then... they cram...cram..cram... it into a little white take out box... and close the lid (they will allow you to have your dressing separate if your not eating it right away). When you open your box up to eat, you have a perfectly tossed, made to order... salad that never ends. It looks like it is about one cup of salad but it goes on and on.. you never seem to get to the bottom. Yummy. I need to put this on my Halifax to-do list.